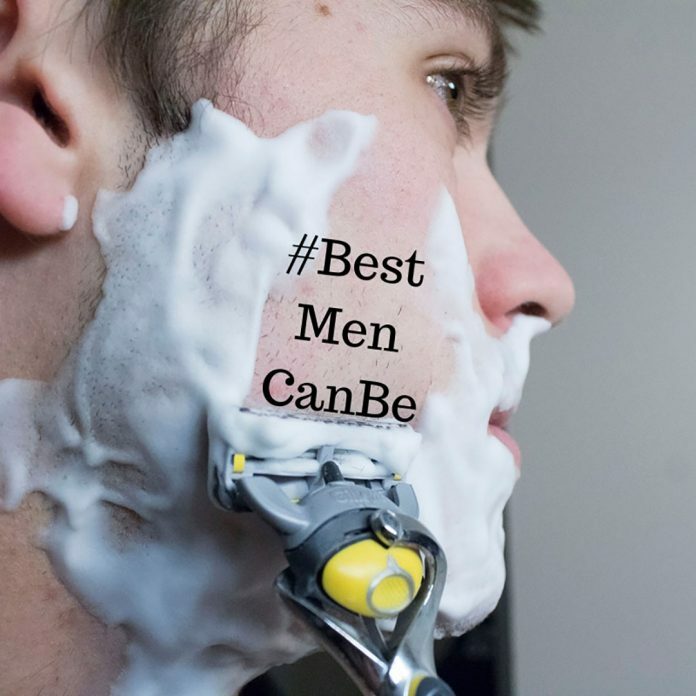 Gillette’s ‘The Best Men Can Be’ advertisement is not just another #metoo campaign, it nicks the skin of something much larger and tackles the issue of toxic masculinity. The ad delves into how negative stereotypes need to change not only for women but more importantly, for men. 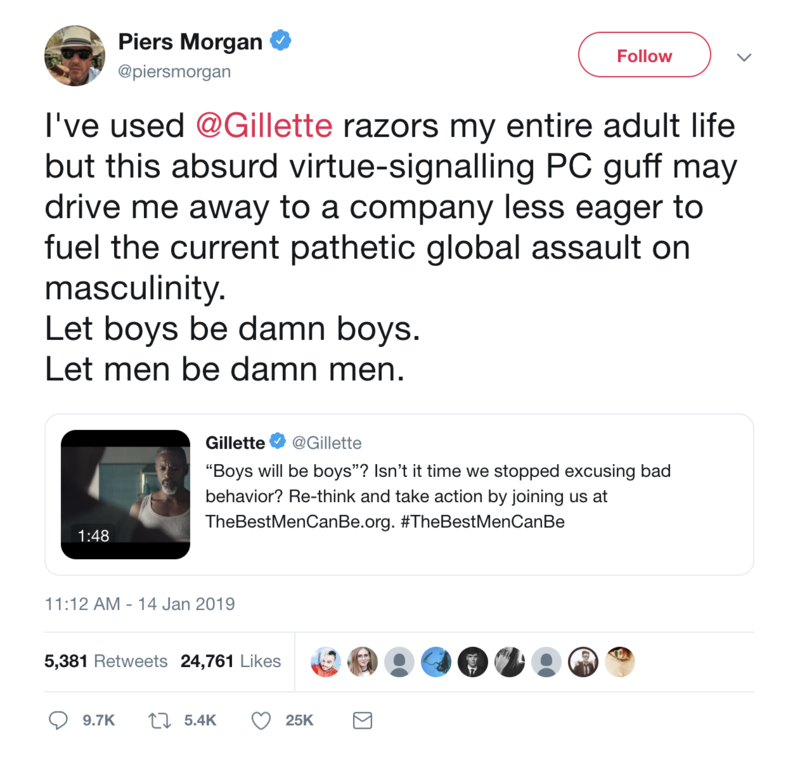 While it can be argued the motivation for the advertisement was money, not change, Gillette still brings attention to an issue in society that needs to be addressed. If you haven’t seen the ad, chances are you’ve heard about it. 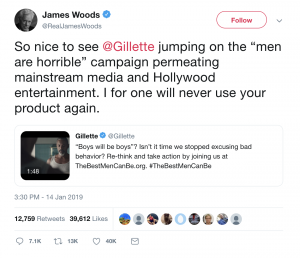 While the ad shows men standing up for women, that wasn’t the entire focus. If you watch it, you’ll realize most of the short film focusses on speaking up for boys. The ad uses scenes of men breaking down stereotypes, such as men don’t show emotion, men can’t be feminine and men have to be protectors/providers. The only thing left out was real men don’t eat quiche. In one scene, a father breaks up a fight between two boys amidst a sea of dads saying, “Boys will be boys.” This is just one of many scenes that encourages men to set better examples for the next generation. Those who paid attention would realize the scenes show men confronting violence. This is important for both men and women. Just look at the homicide statistics in the U.S., Canada and worldwide for 2017 and 2018. According to the United Nation’s Global Study on Homicide: Gender-related killing of women and girls, 80 per cent of all homicide victims in 2017 were actually men, while 20 per cent were women. In Toronto alone, 75 of the 96 homicide victims in 2018 were men and boys. Between 1999 and 2017, more than three-quarters of homicide victims in the U.S were men, according to Security.org, a San Diego based research group. 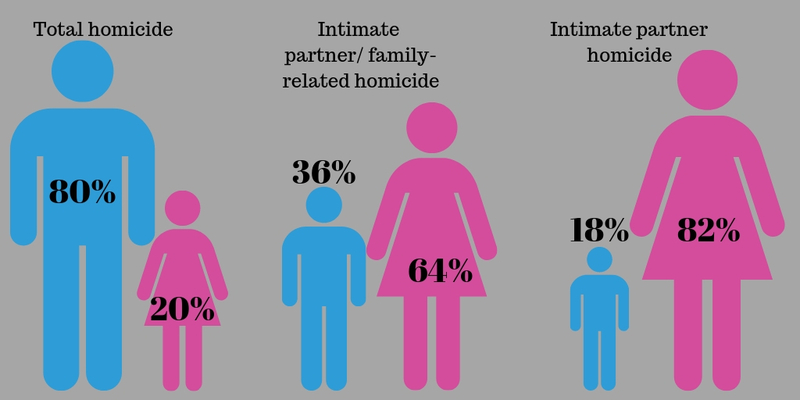 The report also says roughly 9 in 10 people who commit homicide are men in conflict with other men. Scientists used to believe violence was the side effect of testosterone. Now, researchers are leaning toward the idea violence is the result of cultural influences, according to the American Psychological associations 2018 guidelines for Psychological Practice with Boys and Men. The ad encourages men to do better for themselves and the next generation. In 2010, the Bell Let’s Talk Campaign sparked conversations about mental health. 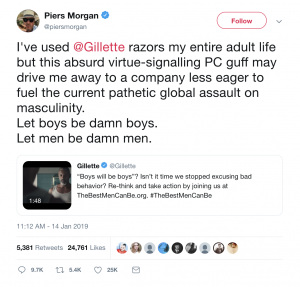 The Gillette ad is making people talk about toxic masculinity and how it is affecting the current and upcoming generation of men. Let’s talk about that. Boys will be men and, as a society, we want those men to be the best they can be.